Picea rubens 'Charlotte's Pillow' is a dwarf form of Red Spruce. Needles are a pleasing rich green on short regularly-spaced branches. Overall form of the plant is that of a flattened cone, growing outward slightly more than upward despite possessing a bit of apical dominance. It is a very compact mound with slow growth of 1-2 " (5-10 cm) per year. The original plant was quite old when discovered but it is suspected to achieve a 2-3 foot (less than one meter) spread and 2 feet (60 cm) in height after 15 -20 years. 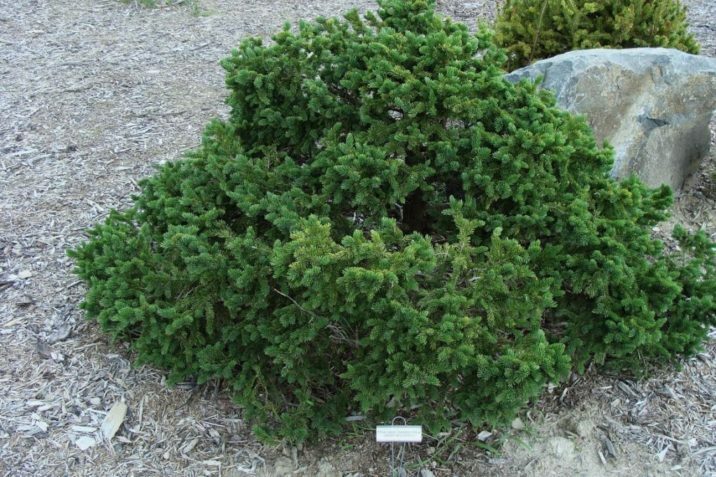 This cultivar was registered through the ACS Conifer Registration program and accepted by the International Conifer Registry at the Royal Horticultural Society. Picea rubens 'Charlotte's Pillow' -- the original plant at Kingsbrae Gardens, St. Andrews, New Brunswick, Canada.